Sibelius is industry standard user friendly notation software that can now be purchased as an annual subscription. The new Sibelius 8 is a more streamlined and efficient than previous versions now you can create a master Avid account which allows you to set up and register your software much faster. Sibelius enables you to express your creativity in brand new ways whether composing for a live performance movie television or media entertainment you can use new features such as integrated annotation and multi-touch gestures to achieve your notation goals. Please note: This product is an annual subscription to the latest version of Sibelius and provides you with a full version of Sibelius for 1 year. The upgrade plan will keep your software up to date with regular automatic software updates. When your subscription runs out the software will stop working. Step into the future! 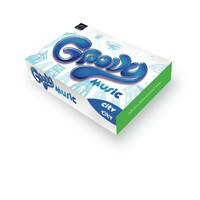 The third installment in the Groovy Music series of programs for primary school children Groovy City helps children learn and create music in a futuristic cityscape. Sibelius is industry standard user friendly notation software this is an upgrade to the latest version of the software on a perpetual license with one year of free upgrades. The new Sibelius is a more streamlined and efficient than previous versions now you can create a master Avid account which allows you to set up and register your software much faster. Sibelius enables you to express your creativity in brand new ways whether composing for a live performance movie television or media entertainment you can use new features such as integrated annotation and multi-touch gestures to achieve your notation goals. Please note: This product is an activation card that gives users of any previous version of Sibelius access to the latest version. Included in this price is a free annual upgrade plan which will keep your software up to date with regular automatic software updates. After the first year you have the opportunity to renew your uprgade plan which is sold on an annual basis if you do not renew your upgrade plan Sibelius will continue to work as normal but you will no longer receive automatic updates to the latest version. Please note this item was returned unwanted from a customer. The original boxing is scuffed and all the seals are broken.Otherwise the unit itself looks and operates as new. This is a great opportunity to buy a fully functioning product at a discounted price supplied with a one year warranty. 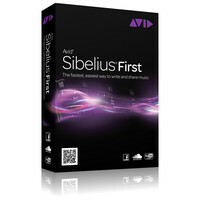 Avid Sibelius First is the fastest smartest easiest way for you to to write and share music – suitable for aspiring composers and songwriters to teachers and students. Even if youre more comfortable playing instruments than using notation software the intuitive interface will guide your songwriting process. Sibelius is the industry standard user friendly notation software. The new Sibelius 8 is a more streamlined and efficient than previous versions now you can create a master Avid account which allows you to set up and register your software much faster. Sibelius enables you to express your creativity in brand new ways whether composing for a live performance movie television or media entertainment you can use new features such as integrated annotation and multi-touch gestures to achieve your notation goals. Sibelius is industry standard user friendly notation software this is an upgrade to the latest version of the software on a perpetual license with one year of free upgrades. The new Sibelius is a more streamlined and efficient than previous versions now you can create a master Avid account which allows you to set up and register your software much faster. Sibelius enables you to express your creativity in brand new ways whether composing for a live performance movie television or media entertainment you can use new features such as integrated annotation and multi-touch gestures to achieve your notation goals. Please note: This product is an activation card that gives users of any previous version of Sibelius access to the latest version. Included in this price is a free annual upgrade plan which will keep your software up to date with regular automatic software updates. After the first year you have the opportunity to renew your uprgade plan which is sold on an annual basis if you do not renew your upgrade plan Sibelius will continue to work as normal but you will no longer receive automatic updates to the latest version. Sibelius is industry standard user friendly notation software that can now be purchased as an annual subscription crossgrade. The new Sibelius 8 is a more streamlined and efficient than previous versions now you can create a master Avid account which allows you to set up and register your software much faster. Sibelius enables you to express your creativity in brand new ways whether composing for a live performance movie television or media entertainment you can use new features such as integrated annotation and multi-touch gestures to achieve your notation goals. Please note: This product is a crossgrade from Finale Notion Encore or Mosaic to an annual subscription to the latest version of Sibelius and provides you with a full version of Sibelius for 1 year. The upgrade plan will keep your software up to date with regular automatic software updates. When your subscription runs out the software will stop working. Sibelius is industry standard user friendly notation software this is the full version software on a perpetual license with one year of free upgrades. The new Sibelius 8 is a more streamlined and efficient than previous versions now you can create a master Avid account which allows you to set up and register your software much faster. Sibelius enables you to express your creativity in brand new ways whether composing for a live performance movie television or media entertainment you can use new features such as integrated annotation and multi-touch gestures to achieve your notation goals. 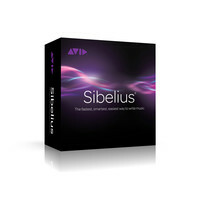 Please note: This product gives you access to the latest full versions of Sibelius. Included in this price is a free annual upgrade plan which will keep your software up to date with regular automatic software updates. After the first year you have the opportunity to renew your uprgade plan which is sold on an annual basis if you do not renew your upgrade plan Sibelius will continue to work as normal but you will no longer receive automatic updates to the latest version. Sibelius is industry standard user friendly notation software that can now be purchased as an annual subscription crossgrade. The new Sibelius 8 is a more streamlined and efficient than previous versions now you can create a master Avid account which allows you to set up and register your software much faster. Sibelius enables you to express your creativity in brand new ways whether composing for a live performance movie television or media entertainment you can use new features such as integrated annotation and multi-touch gestures to achieve your notation goals. Please note: This product is a crossgrade from Finale Notion Encore or Mosaic to the latest version of Sibelius on a perpetual licence. The upgrade plan will keep your software up to date with regular automatic software updates. When your subscription runs out the software will stop working.